Have you ever celebrated yourself on your birthday? I know a lot of people throw birthday parties for themselves every year, but I mean have you really celebrated you? Usually every year I try to avoid telling anyone it’s my birthday, and yet at the same time, I’ll get sad if the people around me forget it or don’t make it as memorable as I actually want it to be. That’s a lot of pressure on the poor souls who know me! 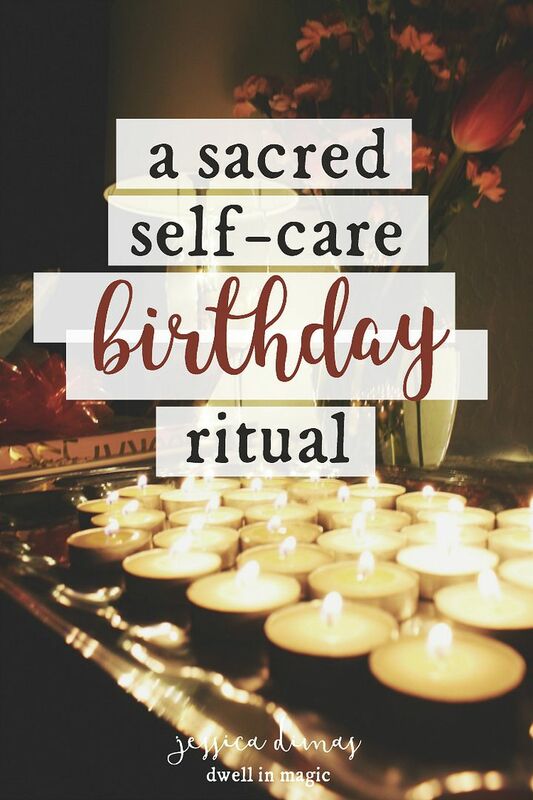 I read the daily book Simple Abundance every morning, and there was a day in December that talked about how to celebrate your birthday with a beautiful self-care ritual. I had never really thought of celebrating my birthday like this, but I instantly knew it would feel transformative and couldn’t wait for my January birthday to get here. I turned 33 this past week, and I have to tell you that this has been the BEST birthday I’ve had since I was probably 5 years old. I know it’s because I was looking forward to doing this birthday ritual and not caring if anyone noticed if it was my birthday or not. I was too busy picking out the perfect gift for me, shopping for the prettiest wrapping paper and bow, gathering all the supplies I would need, and making arrangements so that I had the day to myself. Anything else was just going to be icing on the cake. Beautifully wrapped gift from me to me! 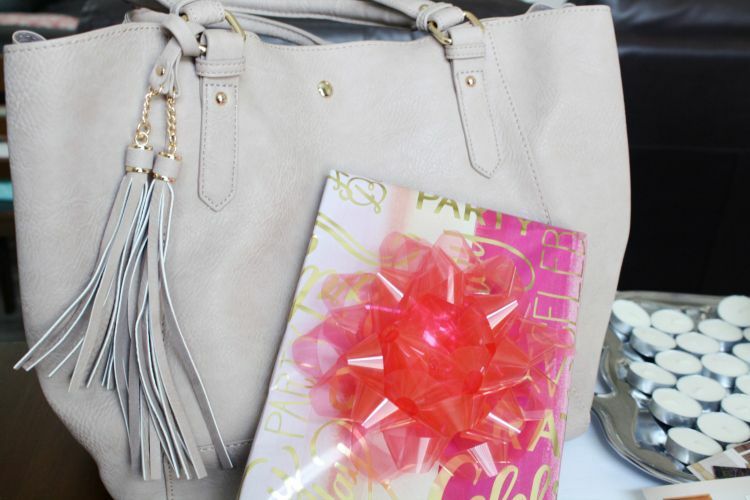 This is part of my gift that I didn’t wrap, which was this purse. I have been carrying the SAME diaper bag for the last three years because I loved it so much. I was in desperate need of a new bag but finding a bag for me is like finding jeans or a bra. I finally found this one on Amazon! And since I still need some sort of diaper bag organization, I bought this insert, which fits perfectly. It’s the perfect mix between a diaper bag and a normal purse. With the house empty and silent after taking my kids to my mom’s house, I pulled all of their toys out of the tub and ran a bath. 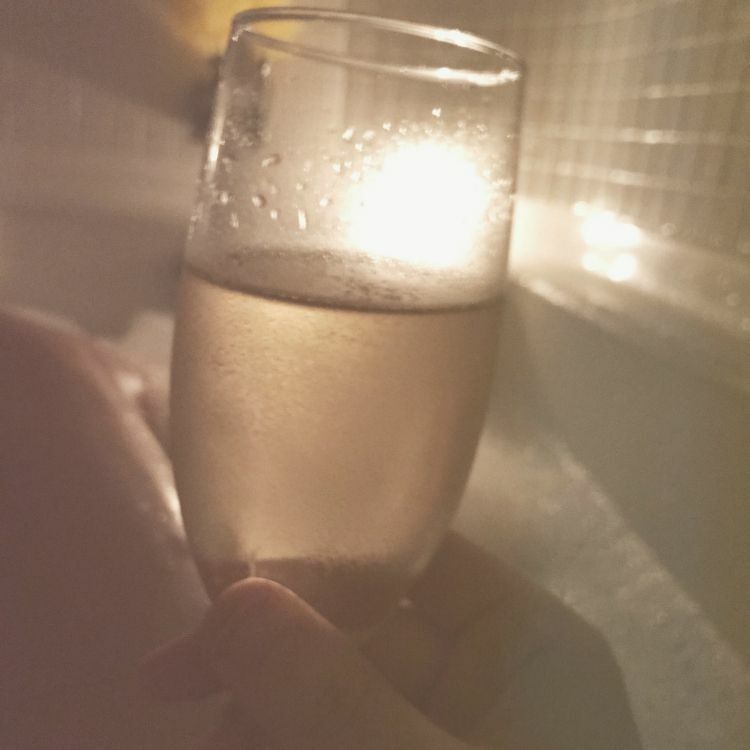 I lit several tea light candles and placed them around the tub, turned off the lights, and enjoyed a blissful and peaceful bubble bath by myself. I thought about the way Sarah said the bath was symbolic of washing away all of the past year’s mistakes, any regrets and any lingering guilt. For me, the only real pain I experienced in the past year was the pain and regret of not being my own best friend sooner. This would be the perfect time to let go of any of the criticisms you’ve been carrying around about yourself. Let go of any disappointment or hurt from others. Let go of any guilt! 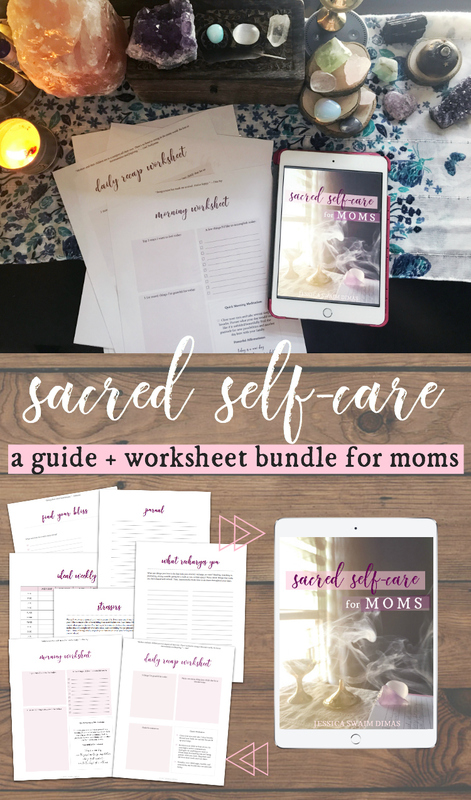 Guilt over not being a good enough mom, wife, sister, friend…guilt over things not being the way you had hoped, guilt over things you wished you would’ve done and things you wished you wouldn’t have. Wash it all away and let it drain with the water. Let it go, this is a fresh slate. A new year. Next to my bed, I set everything up. 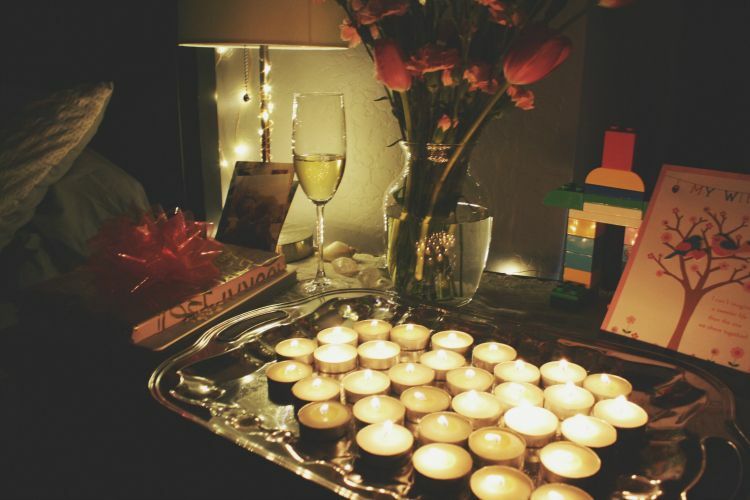 My 33 candles, the card from my husband, the Duplos my boys built for me (of two little brothers holding hands), my favorite bouquet of flowers, champagne, the photos, and my journal. I also had my twinkle lights on that I’ve put up around my bed! “Then I go alone to my bedroom and light one votive candle for each year. My favorite music is playing in the background, fragrant incense fills the air, and beside my bed is a bouquet of my favorite flowers. I put on a brand-new nightgown and get comfortable in my freshly made bed. Then I offer a personal psalm of thanksgiving for my life. 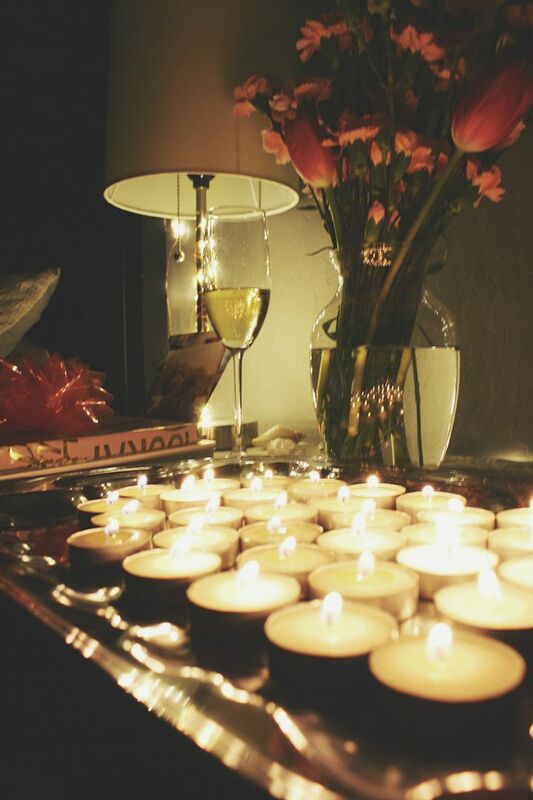 As the candles burn I reflect on my personal journey so far. I look at old and recent photographs, then read selections from my journal. So many wonderful moments from the past year have already slipped from my conscious memory; it’s comforting to call them back for a brief visit. Next I ask for a birthday gift that only the Giver of Good can bestow: to conceive a wonderful new dream or plan; to realize a dream delayed; to overcome an old fear or be released from an old pain; to experience a new freedom; to discover a new strength; to find a new friend; to achieve a long-sought goal; to reach toward a new aspiration; to overcome a new challenge. I LOVED this part. Lighting the candles for each year I’ve been alive felt so special, and taking quiet moments alone to look at old photos, remember the past year, and feel grateful for my life was the most unique way I’ve ever celebrated my birthday. The two other gifts I got myself were these books. 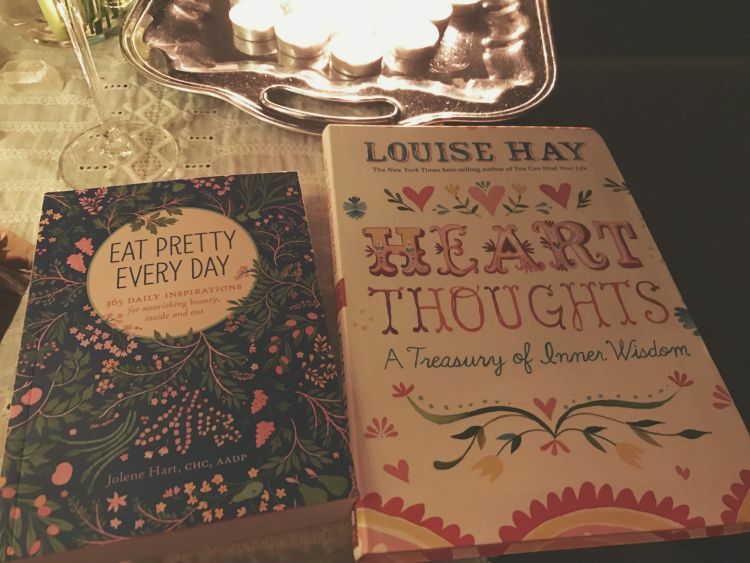 Eat Pretty Every Day has an entry for every day of the year and is specific to the season, and it’s full of self-care ideas, healthy recipes, and mindset tips for shifting the way you view yourself. Heart Thoughts is a gorgeous book by one of my favorite authors, another book on shifting your mindset and releasing negative beliefs about the world and yourself. I’ve added both of these books into my morning self-care routine. 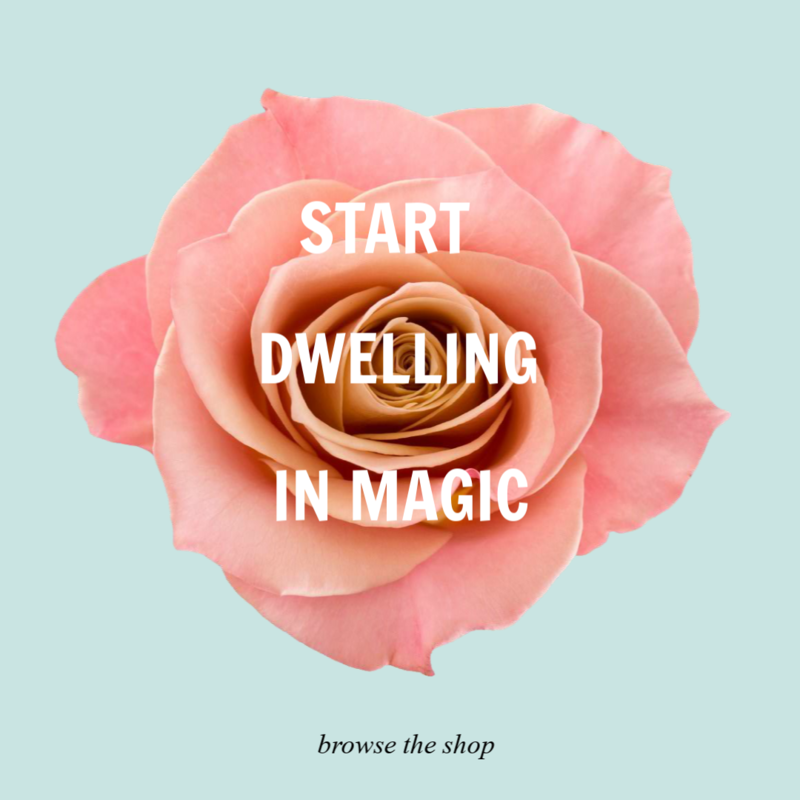 The most magical thing that happened for me with this ritual is that it caused me to have no expectations on others for how my birthday should be celebrated, which in turn manifested an abundance of love pouring in from others. My husband took me out to dinner and it was horrible but I don’t remember a night that I’ve laughed so hard. The day was perfect, and nothing was able to ruin it. Every year that I get older I become more of my own best friend and give myself the things that for so long I thought I needed to get from others. When we relieve others from needing to be the source of our happiness, the ironic thing is that so much more love and acts of kindness flow in from others. And the more love we give to ourselves, the deeper our sense of worth becomes so we’re able to allow others to love us instead of pushing it away because we don’t feel worthy. It’s a beautiful chain effect! 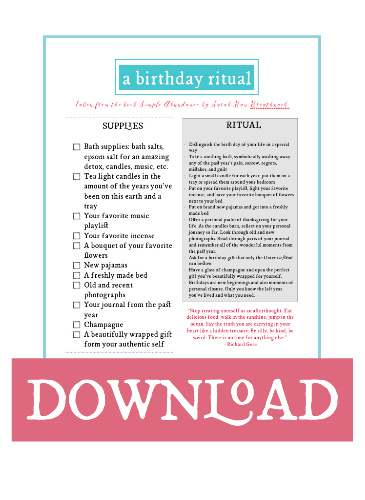 I created this checklist for my own reference when I followed Sarah’s birthday ritual. If you’d like this download, it’s available to my subscribers. Sign up for my newsletter and you will receive it in the welcome email. How do you celebrate your birthday? I hope that whatever you do this year on your birthday, you make time to celebrate yourself and give yourself the best birthday you’ve ever had. Wow, thank you for this beautiful post. Now I can’t wait for my birthday! What a lovely idea. 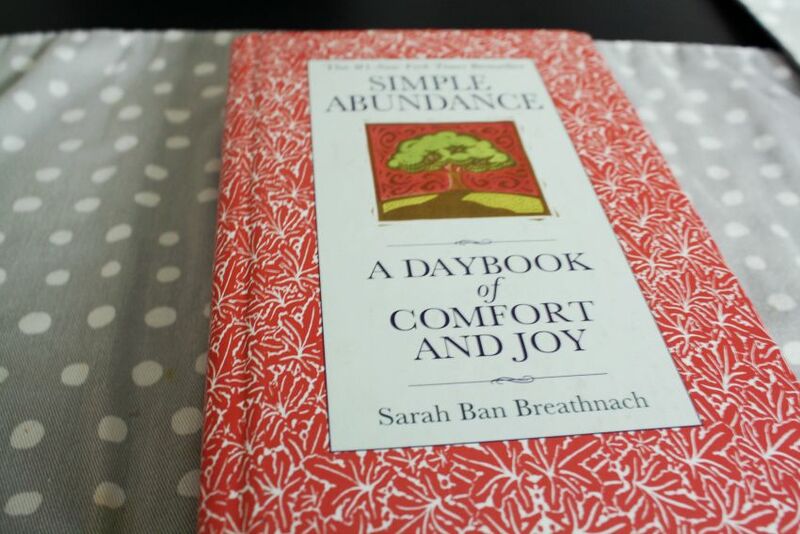 I bought Simple Abundance last year because of your suggestion. It’s a beautiful book and I enjoy reading it often. I just turned 32 on the 10th. I spent my birthday taking care of my four children and husband who were all sick with a yucky stomach bug. The next day, when they were feeling good enough to celebrate my birthday, I was sick! Some how I don’t feel the loss of not celebrating. When I felt better I took some quite time for reflection and did a birthday spread with my new tarot cards (I’m just learning and am having so much fun). According to my cards I’m doing very well in life and my new year looks bright. I am an incurable optimist and my cards always reflect that part of me 🙂 Thank you for this wonderful article and words of encouragement. This is so awesome! 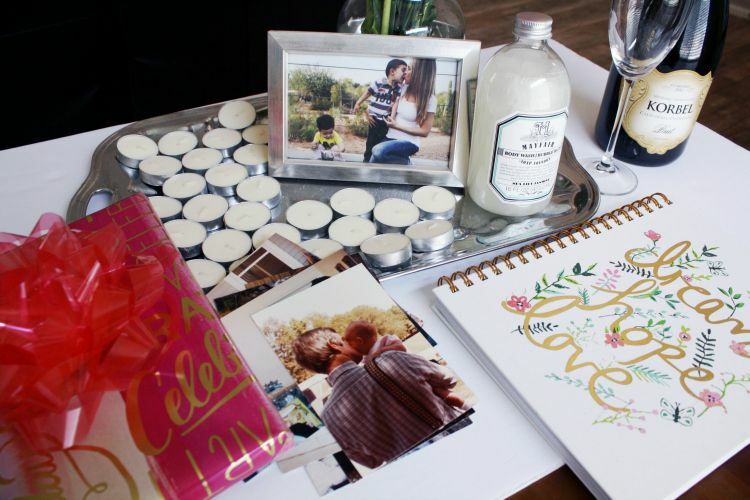 I am definitely someone who looks forward to celebrating my birthday every year (my husband thinks that’s silly haha), so I love this idea! I have never bought myself a present, but I think this year I will! And happy birthday to you!!! My birthday is coming up in 2 weeks and this is just awesome! I plan to do this for my birthday this year. I am also usually alone and never get a Valentine anymore so I decided to show myself some love on Valentine’s day and just ordered Heart Thoughts. I thought that would be such an appropriate book for the day and gift to myself! Thank you for this Jessica! My birthday is later this week and I’m going to try a few of your ideas! I love the idea of new pjs and lighting a candle for each year. I believe our birth day is such a spiritual day and one that should be revered and honored. The past few years I’ve focused on being grateful for myself being alive and doing activities I love. This takes it to another level!! And I adore the Dream, Hope, Love book pictured! I couldn’t find it in any of the links. Is that a journal?? 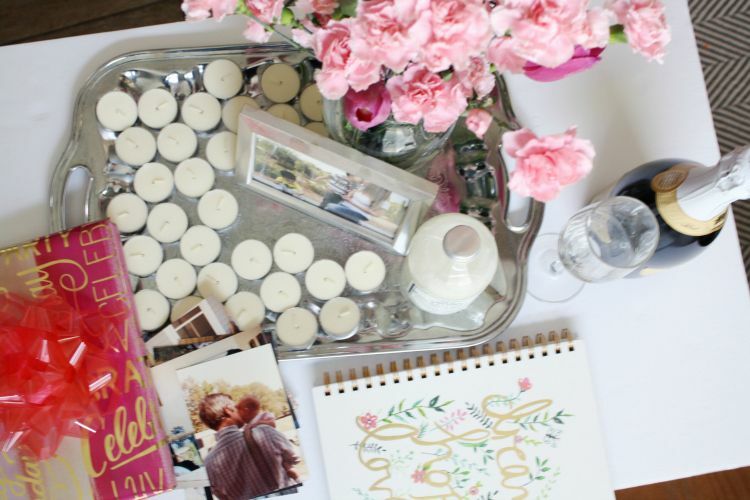 I hope you had an amazing birthday and tried a few of the ideas! I agree, I really do feel like a our birth day should be honored and made to feel like a sacred day. It really does take it to another level feeling that gratitude for your life and focusing on what you love. I won’t go another birthday without doing this! And that Dream, Hope, Love journal was something I found at Home Goods! I tried finding it on Amazon so I could link it but I couldn’t find it.